Where the dock was and no longer is.. This dock would have been one block down from the house where we now live, if this dock still existed. It doesn’t but the photo does show life before in this fishing community on the bay. Photo shows a lively ‘bay’ community. Before the county roads and state highways, the communities on Willap Bay used boats more often than vehicles. As a bay community, people would boat over to other communities to do visiting, shopping, and for get-togethers. The communities on Willapa Bay included Long Beach, Tokeland, Shoalwater, Bruceport, and where Willapa Bay becomes Willapa River, communities of South Bend and Raymond. 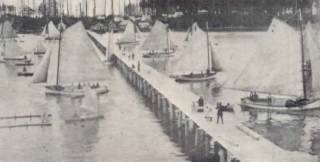 In this photo, the dock has freshly been built, and does not yet have railings, and shows the use of boats by the locals in their everyday endeavors. The dock is no longer there, and with roads and highways now, people drive more than boat in going about daily business.